This Grilled Miso Salmon is a favorite at my house—both for the cook and for the eaters. With very little effort on the part of the cook of whisking together a glaze and spreading it on the salmon, you end up with an amazingly flavorful, moist salmon for everyone at the table. This recipe works for any size filet of salmon—it makes enough glaze for a large (about 4-pound) filet. For smaller pieces, simply make less glaze. Preheat gas or charcoal grill to medium-high heat (you should be able to hold your hand about an inch above the cooking grate for 4 to 5 seconds before pulling it about from the heat). Rinse the salmon and pat it dry. Using tweezers, pull out and discard any pin bones (find pin bones by running your index finger from the tail end to the head end of the salmon along the visible line separating the grain of the filet—you'll feel any small bones poking up). Focus on the bigger ones, towards the head-end of the filet, and work your way down. While it's a nicety for your diners to pull out the pin bones, they are also easy enough to spot once eating. Spread the oil on the skin-side of the salmon and set the salmon, skin-side down, on a tray. In a small bowl, whisk together the miso, soy sauce, and sake. 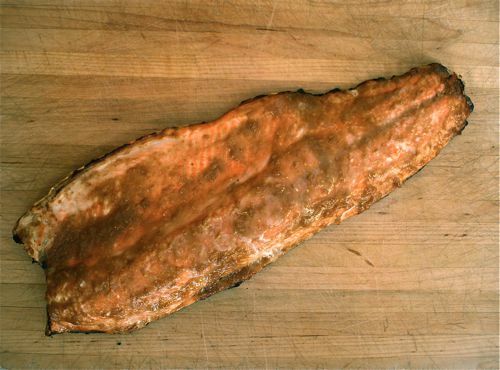 Spread about three-quarters of the glaze evenly over the salmon filet. Place the entire filet, skin-side down, on the grill. Cover and cook until the salmon is cooked to your liking and the glaze is starting to caramelize and brown, about 10 minutes for 1-inch-thick filets medium-well done (just slightly still pink in the middle when poked apart by a knife). Note that with the skin-side down and the grill covered, there is no need to flip the salmon, it will cook fairly evenly, with the skin crisping up nicely for those who like to indulge. Transfer to a serving platter and serve immediately (you may, of course, cut the filet into portions for serving, if you like). As with most salmon, warm to room temperature is very tasty, but the miso glaze fares best when served warm.